Single family residential (SFR) starts were roughly level with one year earlier in the six-month phase ending December 2018. However, multi-family construction starts were down 12% from a year earlier. Multi-family construction remained steady in 2018, with year-end totals the same as the prior year. Demand for multi-family rentals has generally been higher during this residential construction recovery compared to new SFRs. However, buyer-occupant demand for SFRs is gradually increasing as jobs are recovered. SFR construction starts continued to rise in 2018, turning in a 9% increase over 2017. While positive, this rate of decrease is down from the previous year, which saw a 17% rise. Expect SFR construction to continue to slow through much of 2019, the result of rising mortgage rates, slowing sales volume and decreasing home prices. But compared to the 150,000 SFR starts achieved in 2005 at the height of the boom, even 2018’s positive performance – resulting in 62,600 SFR starts – is a fraction of what is needed to meet demand. 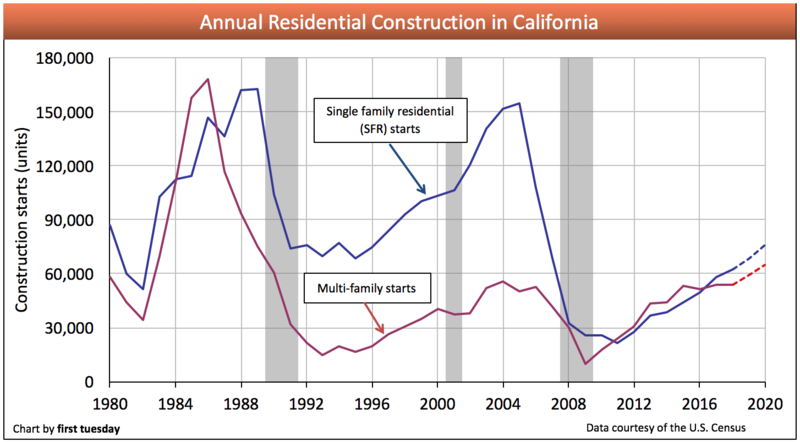 Like SFR construction, multi-family starts amount to just a small amount of what is needed to keep up with rising demand from California’s growing population. State-initiated legislative efforts to add to the low- and mid-tier housing stock have focused on encouraging more multi-family construction. Therefore, momentum will propel multi-family construction forward in 2019-2020, even as home sales continue to slow across California. Updated February 27, 2019. Original copy posted November 2012. This chart illustrates the number of California residential construction starts during semi-annual phases ending in June and December. *Forecasts are made by first tuesday and are based on current new home sale trends, actual construction starts and current government policies. 28,800 SFR starts took place in the six-month period ending December 2018. This is roughly level with the same period one year earlier. 62,600 SFR starts took place in 2018. This is up 9%, or 4,500 starts, from 2017. A slower pace of increase is expected to occur in 2019.
first tuesday‘s forecast for total SFR starts in 2019 is approximately 60,000. This is 4% lower than 2018. SFR starts will fall back in 2019, as builders adjust to slowing sales volume and decreased home prices, all the result of rising interest rates. Subdivision final reports will continue to decline as developers until sense a return of home buyers is on the horizon. The next peak in SFR starts will likely occur during the boomlet period of 2022-2023. 28,80 multi-family housing starts took place in the six-month period ending December 2018. This is a decrease of 3,400 starts, down 12% from the same period one year earlier. 53,800 multi-family housing starts took place in 2018. This was level with 2017, 6% higher than 2016.
first tuesday‘s forecast for total multi-family housing starts in 2019 is approximately 56,500. This is a small 5% increase over 2018. 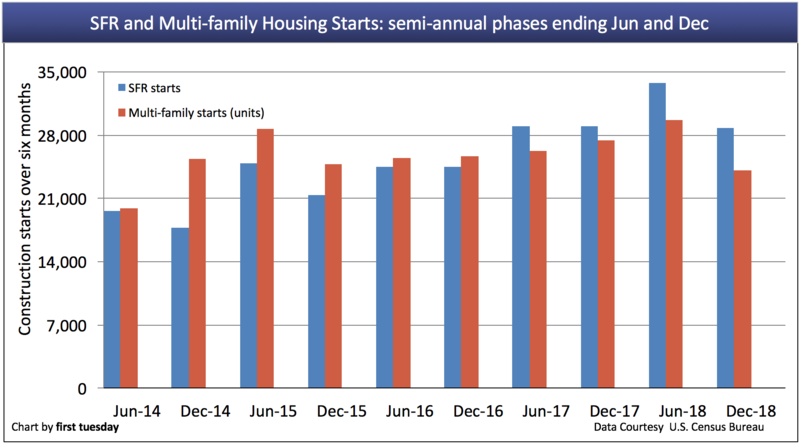 Multi-family housing starts will continue steady in 2019 and 2020, as several legislative changes aimed at increasing multi-family construction encourage more building of dense, low- and mid-tier housing. The next peak year for multi-family housing starts is likely to occur around 2022-2023, with the crest of the next housing boom. 7.0 million owner-occupied housing units existed in California in 2017, according to the U.S. Census Bureau. This is a slight increase over the prior year. 17.4 million people were employed in California at the end of 2018. This is about 1.7 million jobs above the pre-recession peak month of December 2007, according to the California Employment Development Department (EDD), still yet to catch up with the 1.8 million increase in working-aged population. The trough month in employment was January 2010, with 13,686,400 people employed state-wide. The rental vacancy rate at the end of 2017 was 4.3%. Construction starts will continue to falter somewhat in 2019, not to rise significantly until the next recession has come and gone, expected in 2020. The pace of this rise is dependent on several factors, discussed below. End user homebuyer-occupant demand will ultimately determine whether and how fast construction starts for SFRs and condos will continue to climb. Builders rely on buyer-occupants to support new home construction. Discouraged by low inventory, high home prices and rising interest rates, buyer-occupant demand to purchase a home in 2018 remains stunted. This is demonstrated by relatively low sales volume participation and mortgage origination figures. Builders will continue to bide their time until sales volume figures for buyer-occupants pick up, likely in 2019 as prices begin to rise again. California has finally recovered all jobs lost in the Great Recession but at wages which do not cover the interim inflation. Still, considering the intervening population gain (around 3 million), full employment and labor force participation comparable to the December 2007 peak is not expected to be reached until later in 2019 or perhaps 2020.
restrictive zoning regulations, which discourage density in desirable living areas. 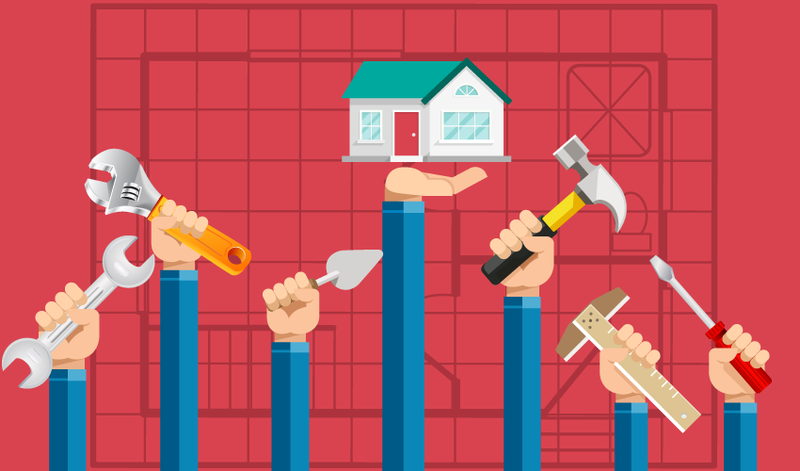 Until these factors are considered and a conclusion reached, builders (and their lenders) may not take for granted that construction starts will pay off. Expect starts to only modestly increase until these factors collectively improve, around 2022-2023. NextRentals: the future of California real estate? 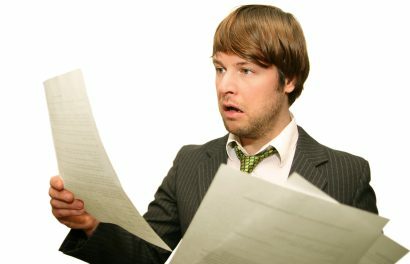 How does the new healthcare tax affect my home sale? It would be helpful to know if any of the multi-family construction increase is privately financed as opposed to gov’t subsidized (ie: “affordable” construction. Lots of useful information, thank you. I noted the construction chart going back to the 1980’s. The chart shows a total collapse of multi-family development beginning about 1986. I wonder how much of this may have been caused by the Reagan tax changes? Prior to that there was a period where limited partnerships built or bought apartments and commercial properties. After the tax change many people decided it was better to invest in a larger personal residence rather than a small income property and the limited partnership industry disappeared. Any thought on how tax law and government policy other than zoning laws can affect change? If you add factors of living in CA… it is extremely costly. Land banking will do good but… having such a high tax state with cost of living so high… plus capital gain on both Federal and State end… does it really make sense??? New construction will only come back when we stop some of the wayward government t programs. 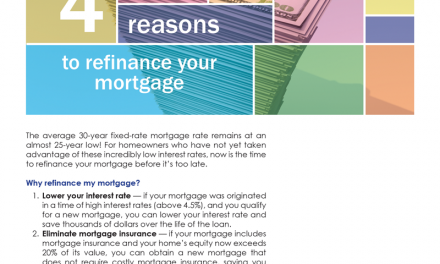 No more debt forgiveness and no more refinancing underwater properties (Harp). It’s time to let the marketplace get back to normal buyer and seller demand conditions so employment will return and demand will new homes will follow. Just hope we elected the right person this time around. It interests us how so many persons, when offering their predictions as to what turn future events and trends might take, virtually NEVER figure in a black swan event. What is that? A black swan event is a dramatic, even cataclysmic event that comes on suddenly and unexpectedly and can have a drastic effect on any prognostication based solely on observable, historical, or cyclical trends. The huge storm in the East–hurricane Sandy–is a type of black swan event. A huge earthquake would be one on the West Coast. Such things can turn the trend-lines upside down. Massive damage means massive reconstruction. Is it good or bad for the economies so affected? MASSIVE SOLAR EVENT IN THE NEAR FUTURE? And no one is figuring in the possible catastrophic solar event that astrophysicists are saying could very likely hit before the end of 2012 or during 2013. (for more info on that see: AthenaAcademy.net/home/current_news). Would such an event bring negative consequences or positive? Apparently Earth has gone through such monumental solar events in the past. Builders are “Re-active” to demand. They are NOT Pro-Active and build for the DEMAND. Long term investors shoot for 5-10 years out like me. I bought thousands of Acres in 2009 to 2012 at the BOTTOM BOTTOM LOW! Builders are consumers of LAND.